"This fresh, simple pasta sauce is an Italian staple and a mouthwatering delight." Bring a pot of water to a boil. Cook the tomatoes in boiling water until the skin begins to split, about 1 minute. Immediately remove the tomatoes and plunge into ice water for several minutes to stop the cooking process. Remove the tomatoes from the ice water; remove and discard the tomato skins. Cut the tomatoes into chunks. Blend the tomatoes in a food processor until smooth. Heat the oil in a saucepan over medium heat; warm the crushed garlic in the oil until fragrant, being careful not to brown, 1 to 2 minutes. Add the blended tomatoes and salt; bring the mixture to a simmer and cook until the sauce thickens, 10 to 15 minutes. Remove the sauce from the heat and stir the basil through the sauce. 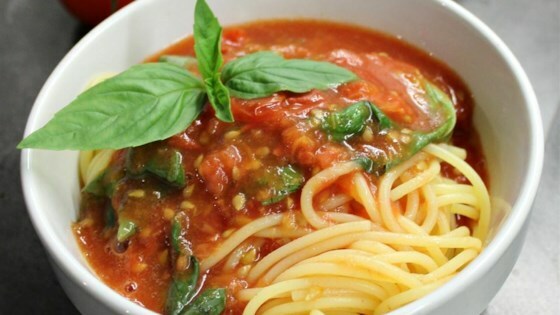 Allow the sauce to sit for a few minutes to allow the flavor from the basil to blend into the sauce. See how to make a quick, creamy, rave-worthy tomato sauce. Delicious! Very easy. Followed recipe exactly. Fresh and light. Will make every summer when I have an over abundance of ripened tomatoes. Excellent. Surprising complex for such a simple recipe. I can't wait to try it with fresh heirloom tomatoes next year! This was a wonderful sauce! I love it's simpliciity. When making larger batches you do need to remove the seeds. Fast and Easy and extremely Tasty!!! !